Plaxico Antonio Burress (born August 12, 1977) is a former American football wide receiver of the National Football League. He was drafted by the Pittsburgh Steelers eighth overall in the 2000 NFL Draft and also played for the New York Giants and the New York Jets. He caught the game-winning catch of Super Bowl XLII as the Giants beat the then-undefeated New England Patriots. He played college football at Michigan State. Plaxico Burress was born to Vicki Burress (now deceased) in Norfolk, Virginia, United States. He was named after his uncle. He has two brothers, Ricardo and Carlos. Burress has been married to Tiffany Glenn since July 2005  and they have one son, Elijah and a daughter, Giovanna, born November 2009. Burress graduated from Green Run High School in Virginia Beach, Virginia in 1996 and spent a post-graduate year at Fork Union Military Academy in Fork Union, Virginia. He lives in Totowa, New Jersey. Burress set a Big Ten Conference single-season record by catching 65 passes in his first season at Michigan State, and also excelled on the special-teams coverage units, using his leaping ability as a kick blocker. He ranks third in career touchdown catches (20), third in receptions (131), and fourth in receiving yards (2,155) in just two seasons at Michigan State University. He was an All-American second-team selection by SportsPage.com and an All-Big Ten Conference first-team pick in 1999. Burress broke the school season-record he set in 1998 (65 catches) with 66 receptions for 1,142 yards (17.3 avg) and 12 touchdowns. He set a Spartans' single-season-record 12 touchdown receptions, eclipsing the previous record of eight Burress shared (1998) with Andre Rison (1988) and Bob Carey (1949). He forced two fumbles, recovered another, and registered seven tackles (five solos) on special teams. Burress set a school record with 255 yards receiving on ten catches against the University of Michigan. He ended his career with a school-record 13 receptions for 185 yards and three touchdowns against the University of Florida in the 2000 Citrus Bowl. He also broke the single-game record of 12 receptions set by tight end Mitch Lyons in 1992. In 1996, he caught 33 passes for 807 yards (24.5 avg.) and 12 touchdowns. Burress was an All–Big Ten Conference first-team selection in 1998 by The Sports Network, and he earned second-team accolades from the league's media. He shared Spartan Outstanding Underclass Back Award honors with tailback Sedrick Irvin and wide receiver Gari Scott. Also, he started All Year at split end and set a school season-record with 65 receptions, topping the previous mark of 60 catches by Courtney Hawkins in 1989. He had more than 100 yards receiving in four games and was ranked third in the conference with an average of 84.4 yards per game and fifth in the conference with an average of 5.4 catches per game. He recorded six solo tackles and forced a fumble on special teams. After being drafted eighth overall in the 2000 NFL Draft, Burress went on to play five years with the Pittsburgh Steelers, amassing 261 receptions for 4,164 yards, 22 touchdowns, and six fumbles over the span of 71 games. Burress was featured on the MTV show True Life, documenting his rookie season. His rookie season saw him on the wrong end on one of the NFL's most infamous gaffes. In a game the Steelers eventually won 24-13, Burress caught a 19-yard reception, with his momentum causing him to fall to his knees. Burress then spiked the ball, believing the play was dead but, since he was not touched while he was on the ground, the ball was still live - allowing the Jaguars' Danny Clark to recover the fumble and run 44 yards with it. He first broke the 1,000-yard mark in his second season, gaining 1,008 yards on 66 receptions. Burress's best season with the Steelers came in 2002, when he set his career highs for receptions (78) and yards (1,325), to go along with seven touchdowns. Also in 2002, Burress played in his first career playoff game, accumulating six receptions for 100 yards and a touchdown. In three subsequent playoff games with the Steelers, Burress totaled only seven receptions, 123 yards, and one touchdown. Burress's 1,008-yard season in 2001, combined with Hines Ward's 1,003 receiving yards, gave the Steelers their first pair of 1,000-yard receivers. The two would combine to accomplish the same feat in 2002. On November 10, 2002, Burress took advantage of an extra 15 minutes of play to set a Steelers' franchise record with 253 receiving yards in a 34–34 tie against the Atlanta Falcons. He caught nine passes and scored two touchdowns in the game, and nearly won it but was stopped at the 1-yard line as time expired. Burress at the Giants' Super Bowl champions parade in NYC. On January 23, 2005, after a playoff defeat, Burress announced his intentions to leave the Steelers. On March 17, he signed a six-year, $25 million contract with the New York Giants. In his first season with the Giants, Burress caught 76 passes for 1,214 yards, helping the team earn an 11–5 record and first place in the NFC East as well as the NFC's fourth seed. However, they were shut out 23–0 by the Carolina Panthers in the opening round of the 2005–06 NFL playoffs. In the 2006 season, Burress managed a career-high ten touchdowns but fell short of the 1,000-yard mark, appearing in only 15 games and struggling with a groin injury for much of the year. The Giants lost six of their last eight games and fell in the NFC Wild Card playoffs to the NFC East champion Philadelphia Eagles 23–20. Burress had a touchdown catch on the opening drive and finished the game with five receptions for 89 yards and two touchdowns. In 2007, Burress was the Giants' top receiver with 70 receptions for 1,025 yards, despite not practicing all season because of his ailing ankle. He also set a franchise playoff record in the NFC title game in Green Bay with 11 receptions for 154 yards as the Giants advanced to Super Bowl XLII. In Super Bowl XLII, Burress caught the game-winning touchdown pass that made the score 17–14 in the Giants' favor over the undefeated (18-0) New England Patriots. He gained a measure of "Super Bowl legend" by predicting the Patriots would lose by the score 23–17. Before their May mini-camp, Burress and his teammates were invited by then-President George W. Bush to the White House on April 30, 2008 to honor their victory in Super Bowl XLII. Just before the start of the Giants' mandatory May mini-camp, Burress had said that he would not participate in the camp because he was upset with his contract. He attended the camp to avoid paying a fine but refused to practice with the team. Although he was slated to receive $3.25 million for 2008, Burress felt underpaid compared to other star receivers. After indicating that he might hold out training camp as well, he joined, but practiced very little, claiming his ankle was injured. In September 2008 Burress did not show up for work on a Monday and could not be reached by phone for two days. On September 24, 2008, the team announced that Burress would be suspended for the game on October 5 for a violation of team rules. $20,000 for post game comments regarding officiating—specifically, inappropriate comments on officiating. $20,000 for unsportsmanlike conduct—specifically, verbal abuse of the head linesman. $5,000 for throwing the ball in the stands. $15,000 for slapping a referee in the face. Burress signed a five-year, $35 million contract extension prior to the season. However, it was an incentive laced deal, with $11.5 million in non-guaranteed base salaries in the contract, non-guaranteed roster bonuses of $3.5 million, non-guaranteed escalators of $5 million based on performance and $1.3 million in non-guaranteed workout bonuses among other things. According to various reports, the Giants would be able to cut or trade Burress after the season and get $23 million taken off their books. On November 2, in the second quarter of the Giants ninth regular-season game against the Dallas Cowboys, Burress caught his 500th career reception. On November 23, 2008 Burress started the game against the Arizona Cardinals in Arizona after being considered questionable with a hamstring injury. The first play of the game he had a 4-yard reception but it was called back on a penalty. Burress left the game and did not return in what would be his final appearance with the Giants. Burress was released by the Giants on April 3, 2009, when it was apparent his accidental shooting court case would take longer than expected to resolve. Burress agreed to a one-year contract worth approximately $3.017 million guaranteed with the New York Jets on July 31, 2011, after turning down a two-year deal from the Pittsburgh Steelers that was rumored to be valued at a little more than the Jets offer but without as much guaranteed money. In his first game back in New York at MetLife Stadium in a pre-season matchup against the Cincinnati Bengals, Burress caught a pass from Mark Sanchez on the first play of the Jets' first drive, and in the second quarter caught a touchdown pass. On October 23, 2011, in a game against the San Diego Chargers Burress caught three touchdown passes from Sanchez, tying a game career high. Burress re-signed with the Steelers on November 20, 2012, after injuries sustained by Jerricho Cotchery and Antonio Brown. On December 30, 2012, Burress caught a 12-yard touchdown pass from quarterback Ben Roethlisberger. Burress had not caught a touchdown from Roethlisberger since 2004. On March 12, 2013, Burress signed a one-year deal to stay with the Steelers. He suffered a torn rotator cuff during a practice on August 8; on August 13, Burress was officially placed on the injured reserve list by the Steelers. On July 22, 2017, Burress was hired by the Arizona Cardinals as a coaching intern. In August and September 2008, Totowa police responded to two domestic disturbance calls at the Burress residence. At both times temporary restraining orders were issued that were later dismissed by the New Jersey state court. On November 28, 2008, Burress suffered an accidental, self-inflicted gunshot wound to his right thigh at the nightclub LQ on Lexington Avenue in New York City when his Glock pistol in the pocket of his black-colored jeans began sliding down his leg; apparently in reaching for his gun, he inadvertently pressed the trigger, causing the gun to fire. The Manhattan District Attorney stated Burress was wearing jeans. The injury was not life-threatening and Burress was released from an area hospital the next afternoon. Two days later, Burress turned himself in to police to face charges of criminal possession of a handgun. It was later discovered that New York City police learned about the incident only after seeing it on television and were not called by New York-Presbyterian Hospital as required by law. New York Mayor Michael Bloomberg called the hospital actions an "outrage" and stated that they are a "chargeable offense". Bloomberg also urged that Burress be prosecuted to the fullest extent, saying that any punishment short of the minimum 3½ years for unlawful carrying of a handgun would be "a mockery of the law." Burress had an expired concealed carry license from Florida, but no New York license. On December 2, 2008, Burress posted bail of $100,000. Later in the day, Burress reported to Giants Stadium as per team policy for injured but active players and was told he would be suspended without pay for the remaining four games of the 2008 regular season for conduct detrimental to the team. In addition, the Giants placed Burress on their reserve/non-football injury list, meaning he was ineligible to return for the playoffs. Burress was also scheduled to receive $1 million from his signing bonus on December 10, 2008, initially withheld by the team. The NFL Players Association filed a grievance, saying the team violated the collective bargaining agreement and challenging the suspension and fine received by Burress. A Special Master in arbitration subsequently ruled that the Giants must deliver the entire $1 million to Burress, as per the collective bargaining agreement. "To think that a player could carry a loaded gun into a nightclub, shoot himself and miss the rest of the season but get to keep his entire signing bonus illustrates one of the serious flaws in the current system," said Giants co-owner John Mara in a statement afterward. On December 23, 2008, a search of Burress's New Jersey home by the Totowa, New Jersey police, the New York Police Department, and investigators from the Manhattan District Attorney turned up a 9 mm handgun, a rifle, ammunition and the clothing believed to have been worn by Burress on the night of his accidental shooting. On June 12, 2009 Burress's attorney Benjamin Brafman announced that he had been unable to reach a sentencing agreement. Burress asked a Manhattan grand jury for sympathy during two hours of testimony on July 29, 2009. On Monday, August 3, 2009, prosecutors announced that Burress had been indicted by the grand jury on two felony counts of criminal possession of a weapon in the second degree, and a single count of reckless endangerment in the second degree, a misdemeanor. On August 20, 2009, Burress accepted a plea deal that would put him in prison for two years with an additional two years of supervised release. His sentencing was held on September 22, 2009. Burress hired a prison consultant to advise him on what to expect while in prison. In January 2010, Burress applied for and was denied a work release from prison. On June 6, 2011, Burress was released from a protective custody unit of the Oneida Correctional Facility in Rome, New York, having served 20 months. Burress had a civil lawsuit, filed on December 8, 2008, in Broward County, Florida, in which Alise Smith claimed that Burress's $140,000 Mercedes-Benz collided with the back of her car. The suit claimed that Burress was liable for causing permanent injuries to the woman. Burress's car insurance policy had been cancelled three days before the accident due to nonpayment of the premium. In 2012, he was ordered to pay Smith $159,000, which he eventually did by May 2013 after a judge had order the sale of his mansion in Virginia Beach. In January 2010, Burress was the defendant in a civil lawsuit brought against him by a Lebanon County, Pennsylvania car dealer, who claimed that Burress was given a leased Chevrolet Avalanche in return for promises to appear at publicity events for the dealership. The dealer claimed that Burress never returned the car and never attended any publicity events; the damaged car was eventually returned after being impounded by the New York Police Department. Burress acknowledged that he was responsible for some of the damage to the car, but asked a jury to determine the amount. On January 15, 2009, the jury returned a verdict awarding only $1,700 to the dealer, who had asked for damages of up to $19,000. According to the Associated Press, Burress has been sued at least nine times since he joined the NFL in 2000. On April 30, 2015, Burress was indicted by the State of New Jersey on charges that he failed to pay nearly $48,000 in income taxes. Burress filed his 2013 State income tax return on October 20, 2014, for which he submitted an electronic transfer. According to the State Division of Taxation, the transfer failed to go through. Burress was notified multiple times in an attempt to collect the tax debt, including via certified mail, but never responded. The indictment made him the first person in New Jersey to be charged under a new state law which treats bad electronic money transfers as a criminal offense, equivalent to writing bad checks. On December 7, 2015, Burress entered into a plea agreement in a hearing at Mercer County Superior Court, admitting guilt in failure to pay $46,000 in taxes on his 2013 tax return (a year in which he earned $1,000,000 in income.) Burress faces up to 5 years probation at his February 5, 2016 sentencing hearing. He will have to pay $56,000 in penalties and restitution. Though he avoided prison time by pleading guilty, failure to pay the amount in full by the conclusion of his probation could result in Burress' incarceration. Burress, co-wrote the book Giant: The Road to the Super Bowl (ISBN 978-0-06-169574-2), published July 1, 2008 by It Books, about his Super Bowl experience. Burress appeared on Celebrity Wife Swap on July 29, 2014. Burress joined SportsNet, New York's SportsNite, making his debut as an NFL analyst on Sunday September 7, 2014. ^ Branch, John (November 30, 2008). "Plaxico Burress Shoots Himself Accidentally". The New York Times. ^ "Plaxico Buress' Wife Tiffany Glenn". Ballers Wives. ^ "Plaxico Burress". New York Giants. Archived from the original on December 21, 2008. ^ Hollander, Dave (October 25, 2007). "Burress Ready to Discover Old World". Sports.aol.com. Retrieved December 5, 2008. ^ "True Life Episode Guide 2001 - I'm an NFL Rookie". TVGuide.com. Retrieved October 30, 2012. ^ a b c "Page 2: Football celebrations gone wrong". ESPN.com. Retrieved August 23, 2017. ^ Pedulla, Tom (November 12, 2002). "Burress reaches for potential". USA Today. Retrieved September 24, 2008. ^ "Hines Ward: Career Stats". NFL.com. Retrieved September 24, 2008. ^ Eisen, Michael (March 18, 2005). "Giants Sign WR Plaxico Burress". Giants.com. Archived from the original on December 4, 2008. Retrieved November 30, 2008. ^ Ashdown, John (February 4, 2008). "New England Patriots 14–17 New York Giants". The Guardian. London. Retrieved February 27, 2008. ^ Office of the Press Secretary (April 30, 2008). "President Bush Welcomes Super Bowl XLII Champion New York Giants to White House". The White House. Retrieved April 30, 2008. ^ a b Garafolo, Mike (June 11, 2008). "Burress sitting out in contract dispute". The Star-Ledger. Retrieved November 30, 2008. ^ a b Schwartz, Paul (June 11, 2008). "Plaxico says he Won't Practice; Upset Over Contract, Giants Receiver Claims it's a 'Business Decision'". New York Post. Retrieved November 30, 2008. ^ "Burress says ankle injury, not contract, keeping him from practice". ESPN.com. Associated Press. July 29, 2008. Retrieved November 30, 2008. ^ Vacchiano, Ralph (September 24, 2008). "Giants suspend Plaxico Burress for one game for violating team rules". Daily News (New York). Retrieved April 23, 2019. ^ Schwartz, Paul. (December 2, 2008).BURRESS DEAL HAS LOOPHOLES New York Post. Retrieved May 15, 2009. ^ "Giants cut WR Plaxico Burress". Daily News. New York. Archived from the original on April 4, 2009. Retrieved April 3, 2009. ^ Cimini, Rich (July 31, 2011). "Sources: Plaxico Burress, Jets agree". ESPN New York. Archived from the original on July 31, 2011. Retrieved July 31, 2011. ^ Hanzus, Dan (November 20, 2012). "Plaxico Burress signs contract with Pittsburgh Steelers". NFL.com. Retrieved November 20, 2012. ^ "Plax extends stay with Steelers". Daily News. New York. ^ "Steelers Place Burress on Reserve/Injured List". Steelers.com. August 13, 2013. Archived from the original on August 15, 2013. Retrieved August 14, 2013. ^ "Plaxico Burress Stats". ESPN Internet Ventures. Retrieved May 8, 2014. ^ "Former New York Giants WR Plaxico Burress hired as Arizona Cardinals coaching intern". upi.com. Retrieved July 22, 2017. ^ "Exclusive: Burress involved in domestic disputes". The Record (Bergen County). September 24, 2008. Archived from the original on September 28, 2008. Retrieved November 16, 2008. ^ Kopel, David (December 4, 2008). "Free Plaxico Burress". Wall Street Journal. Retrieved February 15, 2009. ^ "Press Releases | The New York County District Attorney's Office". Manhattanda.org. Archived from the original on May 5, 2012. Retrieved October 30, 2012. ^ Maske, Mark (November 30, 2008). "Burress Accidentally Shoots Himself in Leg". Washington Post. Retrieved November 30, 2008. ^ Macur, Juliet (November 30, 2008). "Burress Will Surrender to Authorities on Monday". The New York Times. Retrieved November 30, 2008. ^ Italiano, Laura (December 1, 2008). "Bloomberg slams Burress for shooting cover-up". The New York Post. Archived from the original on December 3, 2008. Retrieved December 2, 2008. ^ Macur, Juliet (December 1, 2008). "Plaxico Burress Surrenders to Police". The New York Times. Retrieved December 1, 2008. ^ "Plaxico Burress posts bail as New York Giants weigh options". Los Angeles Times. December 2, 2008. Retrieved December 4, 2008. ^ LaPointe, Joe. 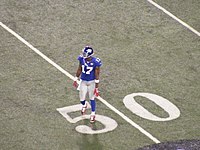 "Giants Say Burress’s Season Is Over", The New York Times, December 2, 2008. ^ Associated Press. Giants suspend Burress four games in wake of weapons charges. ESPN, December 2, 2008. ^ "Non-football injury list protects Giants" Archived December 6, 2008, at the Wayback Machine. New York Newsday, December 3, 2008. ^ "NFLPA files grievance challenging Burress' suspension, fine." ESPN. December 10, 2008. ^ Vacchiano, Ralph; Myers, Gary (April 6, 2009). "Plaxico Burress beats Giants in court, wide receiver grabs million bonus". Daily News. New York. ^ Gun Seized in Search of NFL Player's Home, CNN.com, December 24, 2008. ^ Grace, Melissa (June 12, 2009). "Plaxico Burress case goes long: Failure to reach plea deal delays ex-Giant receiver's trial". Daily News. New York. ^ "Former Giants Star Defends Himself to Grand Jury in Weapons Case", The New York Times, July 29, 2009. ^ a b Zand, Joel (August 20, 2009). "Ex-Giant Plaxico Burress Pleads Guilty in N.Y.C. Gun Case". FindLaw. Retrieved September 22, 2009. ^ Eligon, John; Berger, Joseph (August 3, 2009). "Burress Is Indicted on Weapons Charges". City Room. The New York Times. Retrieved May 22, 2010. ^ Honan, Edith; Trotta, Daniel (August 3, 2009). "Plaxico Burress indicted on weapons charges". Reuters. ^ Italiano, Laura; Mangan, Dan (August 22, 2009). "Plaxico's Jailhouse 'Trainer' - Hires expert to prep". New York Post. Retrieved August 23, 2009. ^ Grace, Melissa; Schapiro, Rich (January 7, 2010). "No early jail release for ex-Giants star Plaxico Burress; work release request denied". Daily News. New York. Retrieved February 5, 2010. ^ Cruz, Alicia (May 17, 2011). "What teams are interested in signing Plaxico Burress?". New Jersey Newsroom. Archived from the original on May 21, 2011. ^ "Former Giants Receiver Plaxico Burress Released From Prison". NY1.com. June 6, 2011. Archived from the original on October 4, 2012. ^ "NFL Star Plaxico Burress to Crash Victim -- Take Your Damn Money". TMZ Sports. May 6, 2013. Retrieved March 27, 2018. ^ "Burress has string of debtor lawsuits". Sports.espn.go.com. February 9, 2009. Retrieved October 30, 2012. ^ "Plaxico Burress Indicted in New Jersey on Tax Charges". newyorktimes.com. Retrieved December 10, 2015. ^ "Plaxico Burress pleads guilty to tax evasion". espn.com. Retrieved December 10, 2015. ^ "Former Giant, Jet Plaxico Burress pleads guilty to tax evasion and now waits on sentencing". nydailynews.com. ^ "Celebrity Wife Swap Episode 313 D.J. Paul/Plaxico Burress". ABC. Retrieved April 23, 2019. ^ "Plaxico Burress SNY's Newest NFL Analyst". 247sports.com.